For decades, a U.S. military installation located roughly 100 miles (161 kilometers) north of Las Vegas had been one of the worst-kept secrets on the planet. Area 51, as it's commonly known to UFO conspiracy theorists and aviation buffs who piece together the details of classified military spy plane prototypes, is a place whose existence the U.S. government long refused even to acknowledge. But in August 2013, the shroud over Area 51 finally lifted, at least a bit. Jeffrey T. Richelson, a researcher at the Washington, D.C.-based National Security Archive, a nonprofit think tank, obtained declassified documents about the development and use of the U-2 and OXCART surveillance aircraft in the 1950s and 1960s. The documents made repeated references to Area 51 and detailed how it was selected as a testing area by the CIA, the U.S. Air Force and defense contractor Lockheed because of its remote location. They even included a map that confirmed its exact location [source: National Security Archive]. The base's current primary purpose is publicly unknown; however, based on historical evidence, it most likely supports the development and testing of experimental aircraft and weapons systems (black projects). The intense secrecy surrounding the base has made it the frequent subject of conspiracy theories and a central component to unidentified flying object (UFO) folklore. Although the base has never been declared a secret base, all research and occurrences in Area 51 are Top Secret/Sensitive Compartmented Information (TS/SCI). 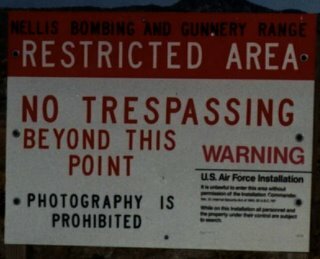 In July 2013, following an FOIA request filed in 2005, the CIA publicly acknowledged the existence of the base for the first time, declassifying documents detailing the history and purpose of Area 51. 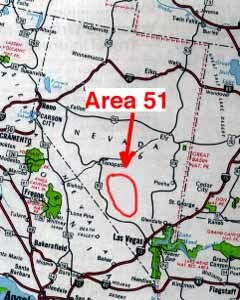 Area 51 is located in the southern portion of Nevada in the western United States, 83 miles (134 km) north-northwest of Las Vegas. Situated at its center, on the southern shore of Groom Lake, is a large military airfield. The site was acquired by the United States Air Force in 1955, primarily for the flight testing of the Lockheed U-2 aircraft. The area around Area 51, including the small town of Rachel on the aptly named "Extraterrestrial Highway", is a popular tourist destination. The perimeter of the base is covered with ground sensors and listening devices to detect even the smallest intrusion. It is also heavily patrolled by armed guards from the Wackenhut Corporation, a very serious private security firm. These guys aren't your normal rent-a-cops that local concert promoters use. In short, they will kill you. End of story. We may have Tang thanks to the space program, but who gave us such innovations as the Stealth fighter and Kevlar? Aliens, of course. Conspiracy theorists believe that the remains of crashed UFO spacecrafts are stored at Area 51, an Air Force base about 150 miles from Las Vegas, where government scientists reverse-engineer the aliens' highly advanced technology. Fodder for this has come from a variety of supposed UFO sightings in the area and testimony from a retired Army colonel who says he was given access to extraterrestrial materials gathered from an alien spacecraft that crashed in Roswell, N.M. Some believe that the government studies time travel at Area 51, also known as Groom Lake or Dreamland. The government has developed advanced aircraft and weapons systems at nearby Nellis Air Force Base, including Stealth bombers and reconnaissance planes. And the government's official line — that the details of Area 51 are classified for purposes of national security — is only seen as further proof that the military is hiding aliens or alien spacecraft.